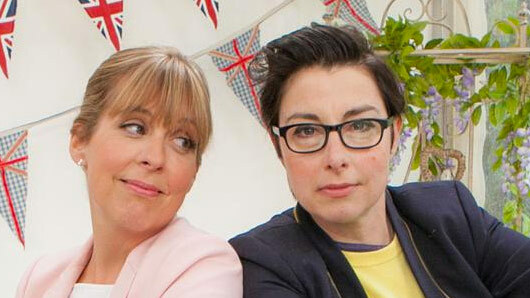 Mel Giedroyc and Sue Perkins have confirmed they will not return to host The Great British Bake Off after it moves to Channel 4 in 2017. The comedy duo have presented the show since its humble beginnings on BBC Two in 2010. However, it was announced last night that the BBC had lost the right to broadcast the series after a year of contract negotiations. It was later revealed Channel 4 had agreed a £25 million a year deal with Love Productions, who produce the show. Mel and Sue said in a statement today (September 13): “We were very shocked and saddened to learn yesterday evening that Bake Off will be moving from its home. We made no secret of our desire for the show to remain where it was. “The BBC nurtured the show from its infancy and helped give it its distinctive warmth and charm, growing it from an audience of two million to nearly 15 million at its peak. “We’ve had the most amazing time on Bake Off, and have loved seeing it rise and rise like a pair of yeasted Latvian baps. The news comes after Perkins retweeted a BBC statement urging Love Productions to “change their mind” over the decision to part ways with the BBC. Attention will now turn to long-serving judges Mary Berry and Paul Hollywood and whether they will remain with the baking competition on Channel 4.